Dr. Gupta’s passion for pain medicine is to provide and help maintain the basic quality of life – through a multidisciplinary approach: medications, pain management interventions, physical and psychosocial therapy. Dr. Gupta received his medical training at Western University of Health Sciences. From there, he completed his residency in Anesthesiology at the University of Massachusetts Medical Center. He then completed his fellowship in Interventional Pain Medicine at the world – renowned Brigham and Women’s Hospital, Harvard Medical School. As a chief fellow, he had the opportunity to provide pain management services at the Dana-Farber/Brigham and Women’s Cancer Center; where he worked with patients through the Pain Palliative service, utilizing interventional therapies. He further pursued his career as a primary author publishing chapters in various academic Anesthesiology and Pain Medicine textbooks. Dr. Gupta truly believes that it is a privilege to provide care not only to the patients, but to their families as well. I can’t thank Dr. Amit Gupta enough for believing in me and caring for my pain concerns on a personal level with professionalism and humanity. I especially appreciate how he takes the time to patiently explain exam results and treatment options without judgment. Prior to seeing Dr. Gupta my back pain was extremely severe, where I was seeing several doctors who ultimately determined after numerous epidurals, physical therapy sessions, medications, I needed surgery. Due to high doses of prescribed pain medications I was referred to Dr Gupta to manage my pain medication before surgery. I was examined and had an extensive conversation on past back history and treatments. Dr Gupta took time to confer with my other doctors regarding my condition and reviewed my MRI’s etc. Based on the information, he determined that he could do a quick procedure that could reduce my pain significantly and could postpone or eliminate the need for surgery. Due to my young age this would be in my best interest. I was skepticle at first, but decided to have the procedure done because I was desperate for pain relief so I could once again function at a normal level. the results were amazing! Dr Gupta continues to monitor my progress and is always a phone call away and always willing to help. Society would definitely benefit with more caring non- judgmental upbeat and professional doctors like Dr Gupta who want to make a positive difference in their patients lives! On my first visit to Dr. Gupta’s office, I had to come via wheelchair for the pain was so intense that it made it unbearable to walk. After that initial visit with Dr. Gupta scheduled an emergency epidural for 2 days later, not waiting for his normal procedure schedule which would have been 1 week later. All I can say is “THANK GOD” for Dr. Gupta for after that procedure I was able to walk without pain. Unfortunately the condition that I have there is NO sure fix for but because of Dr. Gupta and continued treatments I am able to live better quality of life without pain and without surgery. I wanted to take this opportunity to thank you once again for the incredible relief from my pain that you gave to me. When I first came in to see you, my back was in excruciating pain and my quality of life was almost gone. Throughout your treatment plan, I continued to feel better until I finally was able to get around with minimal pain and increased energy. After my back, you worked on my legs, which at the beginning were so painful, I could hardly walk. Thanks to your treatment, I am able to function now and am enjoying taking care of my granddaughter, which I couldn’t do before. I wanted to thank you for the medical treatment that you have provided me. As you know, I served as a police officer with the L.A.P.D. for many years. And during my career, I received several injuries mostly to my upper body such as neck, shoulder, back and head injuries. Although I am now retired, these injuries continued to cause a lot of pain in my every day life. I have taken many different kinds of pain medications but it did not allow me to achieve a normal life as I felt I was impaired most of the time. So I want to thank you for your approach to pain management as your treatments have allowed me to function 80 to 90 percent painless!! It is complete turn around for me now where I can function normally and virtually pain free. I now have only one pain medication that I use occasionally as before I was taking up to 5 or 6 types of pain medication. I hope you share this message with other patients who suffer from chronic back and neck pain and can tell them that I highly recommend that they see you for treatment. Thank you very much for your treatment and I will continue to see you as my pain management doctor. Thank you doctor Gupta. I would not be functioning like I am without you! I thank God every day that I “Googled” for a new pain management doctor and found Dr. Gupta. I had been going to another doctor for 2 years with pain on the whole left side of my body. I went through every X-ray and MRI possible and was diagnosed with Spinal Stenosis and then put through 3 different kinds of physical therapy, acupuncture and chiropractic. I tried everything and the pain level as the same. When I went to Dr. Gupta in January 2013 my pain level was usually at an 8. Now 7 months later I have experienced levels of 2 and although my issue is with me for a lifetime he has helped me make it manageable and through injections has helped reduce the pain over 70% and the amount of pain medication has been lowered by over half, were not done yet either. I can’t begin to describe the gratitude I have for Dr. Gupta. He has made an incredible difference in the quality of my life and has returned me to a place where I can once again enjoy living. Prior to my first visit to Dr. Gupta’s office, I had been bedridden for three days due to excruciating pain that had been building over the past seven years. Every surgeon I had seen about my condition had stated that invasive surgery was my only answer. I believed that it was inevitable. I had merely come to see Dr. Gupta to help me get through the weeks until surgery. I was amazed by the genuine concern Dr. Gupta had for me as both an individual and as a patient. He didn’t simply try to numb the pain, rather he worked on finding a solution to eliminate it. I could not believe the success I had with his treatments. I decided to forgo surgery and continue having Dr. Gupta manage my condition. Though this is a condition that will need to be treated for the duration of my life – the future looks so much brighter with Dr. Gupta assisting me along the way. Welcome to AG Pain Management. The only full time Interventional Pain Management practice in Simi Valley. 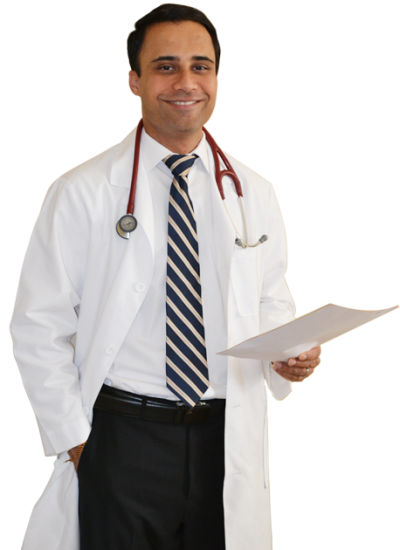 Our goal is to provide sincere service based upon honest and open communication, and easy access to Dr. Gupta. Success in excellent pain care begins with the accurate diagnosis.